During first year my friend and I made a pact to visit Columbia Road Flower Market (it is only one stop away from Queen Mary after all). Fast-forward to the end of our second year, and we finally fulfilled that pact. It is fair to say that we regret not having visited it earlier- it is Bethnal Green’s equivalent of Shoreditch; hipster vibes literally pulsate in the air and an eclectic array of people crowd the street, which in itself is an explosion of colour. Every Sunday from 8am – 3pm, the street metamorphoses into a tropical jungle of foliage and flowers, thus brightening up your day regardless of the weather. Bucketfuls of flowers overflow from stalls into the streets, creating a red carpet of blossom for you to walk through! I was a bit overwhelmed walking through the flower market as it took me back to when my Nan used to take me to her local one at Woolwich- it is everything you need in a market and models itself on the traditional, cockney markets famous in the East End of London. Market sellers shout out their advertising jargon as you walk past, you can expect phrases such as: “Everthin’ a fiver” and “Come n grab yourself a bargain” from the well practised barrow boys. The harshness of their voices is refreshing and fills you with pleasure at the prospect of bartering with them for lower prices. Quite frankly, Columbia Road Flower Market is a staple of the old fashioned trade before it all became so heavily commercialised. The fact it is still flourishing (there were so many people my friend and I lost each other several times in the swarming crowd) is a testament to their humble and down to earth (pardon the pun) method of trade. The best time to actually purchase your desired plants after having a mooch is close towards when the market ends (around 3ish) as sellers begin to reduce the prices of their stock. After all, flowers are fresh so only last for a limited time and it would be a crime to throw them away. Visitors can purchase everything from bedding plants, 10-foot banana trees, pineapples, fresh lavender and as my friend and I overheard two old ladies whisper knowingly: ‘cacti which are all the rage with young generations today’. I can confirm this statement as my friend and I were both searching for a cactus or two and were blown away by how cheap and reasonable everything was priced; I know for a fact that the price of one mini cactus in Urban Outfitters is £3.50 (I have one or two in my room already). However, you can pick up three of these very same cacti for just £5! 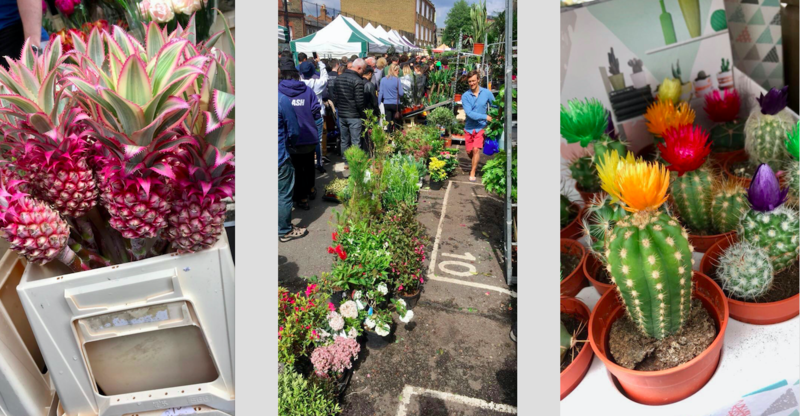 Visitors can also discover quirky and unusual plants that are not stocked in usual garden centres or retail places, thus proving that Columbia Road Flower Market really does promise to give its loyal consumers produce they will most certainly not find anywhere else. 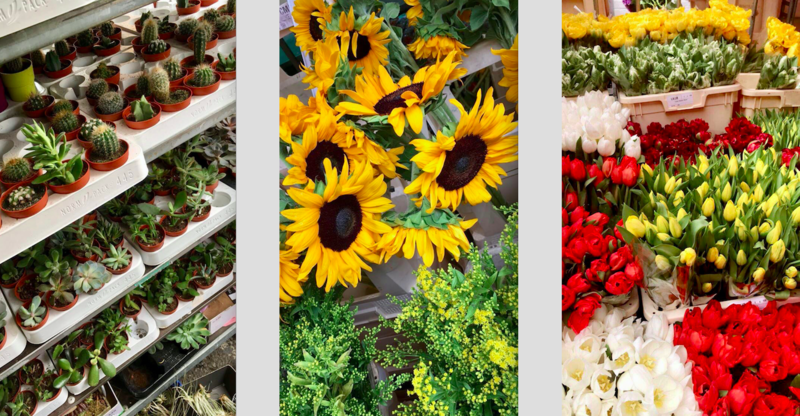 The proof of this comes from the fact that a lot of the flower sellers actually grow their own plants or import flowers from around the world- to them, flowers are not just a way of making money, flowers really are their way of life. Columbia road, aside from the beautiful flowers which are the main attraction of the market, is also home to sixty independent shops from small art galleries, to cup cake shops, to vintage clothes shops, English and Italian delis, and antique shops. Word on the street is that ‘Jones Dairy Café’ is the best for organic and local produce and ‘Treacle’ is the best for a no-frills, honest British baked good. So once you have finished perusing all the flowers, there is still plenty more to do! 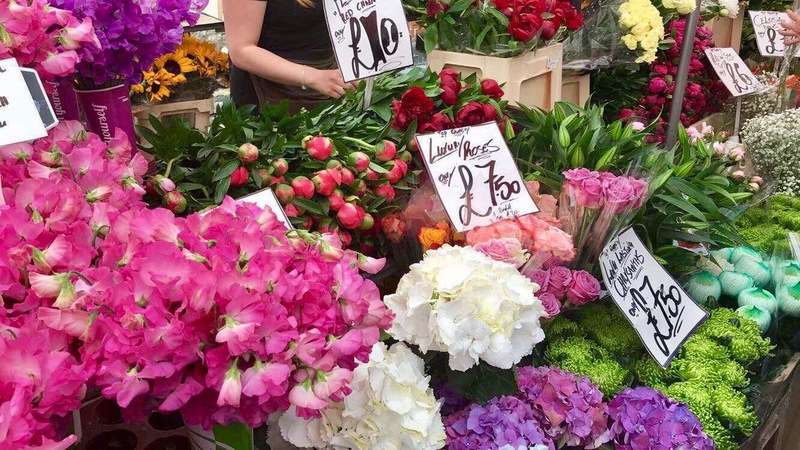 Columbia Road Flower Market is also a short walk from Brick Lane, which is where my friend and I spent the rest of our afternoon in a trendy tea shop which played heavy rock music as we had our deep heart to hearts – something you can only expect in London! Columbia Road’s website states that: ‘[t]he shops have a common thread, a love of the flower market and its history, and a refusal to be dictated to by a retail world where the sense of fun has all but gone.’ I feel this is the perfect sentence to end this article as it sums up the market itself and also the community that the market represents. Nearest Station: Bethnal Green Tube Station- the market is a 10-15-minute walk from there.